The addax is a rare species of antelope that is remarkably adapted to the harsh conditions of Africa's Sahara desert. As a result of excessive hunting, the addax is classified as critically endangered by the International Union for Conservation of Nature. The small population that remains is found in the Termit & Tin Toumma National Nature & Cultural Reserve in Niger. 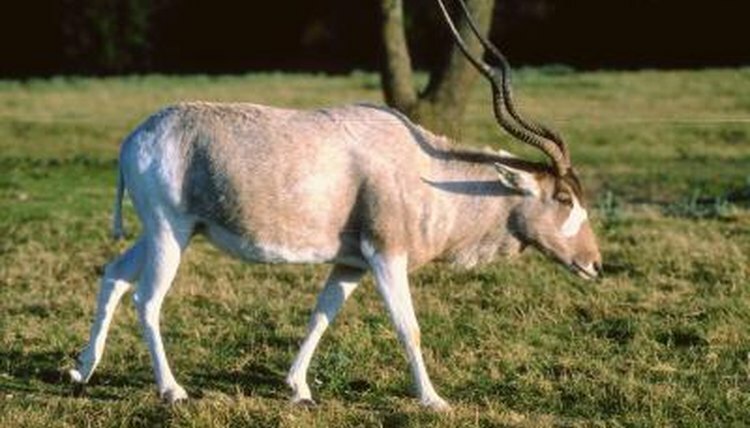 The addax antelope has white markings around its eyes on an otherwise gray or beige face and a toupee-like tuft of brown hair atop its head. To help maintain a stable body temperature, the addax's coat changes from a reflective white in the summer to a grayish-brown in the winter. Its hair also grows thicker in the winter. Like all antelope, the addax is an ungulate, or hoofed animal. Its hooves are wide and flat on the bottom, an adaptation that helps it walk on sand without sinking, but limits its ability to run. An addax weighs between 130 and 300 pounds. The addax is one of only a few antelope species in which both males and females have horns. The horns, which resemble coil springs, can be three feet long in older individuals. The addax, like most antelope, is a grazer, which means it feeds on grass. Aristida grasses and the inner parts of panicum grass comprise most of its diet. Because they get most of their hydration from the dew and sap of the plants they consume, addax antelope can go months or years without drinking water. Addax are a nomadic antelope; they travel around the desert in groups of up to 15 individuals, seeking areas where rainfall has regenerated the plants they eat. Addax are nocturnal, to avoid the sweltering daytime temperatures of the Sahara. They keep cool during the day by resting in the shade of boulders. Addax are also known to lie down in depressions they create in the ground by using their front paws to push hot surface sand aside, exposing cooler sand below. During her peak reproductive years, a female addax in good health may bear one calf annually, usually in the spring or winter. Gestation ranges from 257 to 264 days. Addax calves, which weigh approximately 13 pounds at birth, can walk soon after, but continue to nurse until they are between 7 and 8 months old. The calf's coat is cream-colored; the species' distinctive facial markings develop later in life.